Van Andruss, who formerly owned and operated Macleod's Books in Vancouver, is the Lillooet-based publisher and editor of Lived Experience, a journal that includes writing from his many acquaintances and friends. He is also a co-editor of Home! A Bioregional Reader (New Society, 1990). 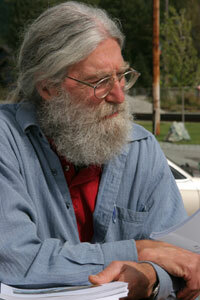 In 2012, Andruss completed his long-in-process biography of mentor Fred Brown who led two pioneering settlements in B.C. and taught at SFU. In A Compass and a Chart: The Life of Fred Brown, Philosopher and Mountaineer (Lillooet: Lived Experience Press unpriced), Andruss, as a self-avowed protégé, has documented Brown's peripatetic journey as a leftist thinker, while often skipping over Brown's troubled private life. The 391-page tribute includes the fascinating story of how Fidel Castro hired Brown to serve as the head of the University of Havana philosophy department in the early 1960s even though Brown could speak only rudimentary Spanish. While living in Havana not long after the Cuban Revolution, Brown's daughter Satya met Castro in a restaurant. Along with Castro's cohorts and Satya's Canadian girl friend Bella Scup, they all shared a convivial meal at the girls' apartment whereupon Castro, upon learning Satya's father was a philosopher, whimsically decided to invite Fred Brown-someone he had never met-to come to the University of Havana to teach. At the time Brown was marooned in a teaching job at Telegraph Creek in northern B.C. Fred Brown and his wife Phyll were subsequently given a house in the New Vedado district of Havana in 1963. Brown eventually delivered a few lectures in October of 1964 but was hospitalized when he blacked out. The Cubans financed Fred Brown's journey to Prague in December of 1964 where he underwent treatment for alcoholism. He didn't return to Havana until May of 1965. Shortly thereafter, the Browns returned to Canada; Satya became a doctor in Cuba and married a fellow Cuban doctor.